Thread: A real mob job?? Bobby Kennedy, brother Jack, and Martin Luther King were victims of state-sponsored terrorism - Sirhan, Lee Harvey Oswald, and James Earl Ray falsely blamed for assassinations they had nothing to do with. June 5 marks the 50th anniversary of RFK's state-sponsored murder. Sirhan was set up as a convenient patsy, the same way Oswald and Ray were used. Elimination RFK was "in part intended to prevent a reinvestigation into his brother's death...The assassinations of RFK and JFK were both (state-sponsored) conspiracies." "Both involved the destruction of evidence. Both involved the fabrication of evidence. Both involved framing their patsies." "Both involved complicity by local officials. Both involved planning by the CIA. Both were used to deny the American people (their) right to be governed by leaders of their own choosing." In 1968, RFK was virtually assured to be Democrat party nominee for president, favored to defeat Richard Nixon in November - an intolerable prospect for US dark forces, why Bobby had to be eliminated. Fetzer explained RFK was struck multiple times by lethal gunfire. Sirhan's gun was the wrong caliber. One bullet wound was "about 1.5 inches…behind (Bobby's) right ear." Sirhan was never that close - "in front of him," not behind. Autopsy results showed Bobby was struck by four bullets "fired from behind at upward angles…five others close to him…wounded by separate shots…as many as 13 fired." Autopsy results clearly proved Sirhan's innocence. Security guard Eugene Cesar stood right behind Bobby with a drawn gun of the same caliber as the murder weapon. In January 2010, prison teacher Gerald Reynolds interviewed Sirhan (now in his mid-70s) - imprisoned for half a century, his life destroyed for a crime he didn't commit. Reynolds: "Did you do it?" eynolds: "Did you kill Robert F. Kennedy?" "The real assassin appears to be Kennedy's 26 year old Ace Security Company bodyguard...Thane Eugene Cesar." "At least one eye witness claims to have seen Cesar with a smoking gun in his hand immediately after Kennedy fell to the floor." "An audio recording made during the assassination indicates that there were at least 11 shots fired (perhaps more) from possibly three different guns." "The conclusion is that Kennedy was shot three times from behind with a fourth bullet passing through his suit coat. The fact that you (Sirhan) were standing in front of Kennedy is undisputed…"
"(T)he coroner's report (said) not one bullet entered Robert F. Kennedy from the front of his body." Sirhan: "Oh my! I knew this morning when I woke up that God was telling me he had something great in store for me today and this is it! God has sent you to me…Thank goodness somebody else knows." Sirhan stressed "they stole his life…(He's) been rotting in that stinking prison…for nothing…The bastards stole my life. I have been denied parole 13 times." It's now 15 times. US dark forces intend letting him die in prison - parole panel members saying he failed to show remorse or understand the enormity of his crime (sic) used as a convenient pretext to let him rot behind bars. In March 2016, the US Court of Appeals for the Ninth Circuit denied Sirhan's right to appeal, ending his hopes for a new trial, his only chance to prove he had nothing to do with killing RFK. 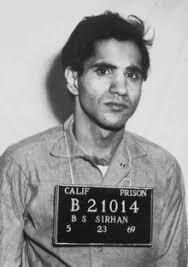 I don't know if Sirhan received a jury trial or if he confessed under duress like James E. Ray(America's most famous political prisoner) but if he did, he got better treatment. This man Ray was denied a trial by jury every year for 19 straight years. A shard of info on his case that most aren't aware of. Last edited by Svengarlicky; May 31st, 2018 at 02:33 PM. Who IS the 'Real You'?